Torch Songs- for our turning times is a compilation of love songs for life to help light the way in these challenging times. They are songs to hear, to sing, to dance with. Songs of celebration of the fire, the waters, the moon, the trees. Songs of could retrieval and of letting go. They are made in honour of life, in honour of the torch of life passed to us by those who came before, in support of us who live now, and in prayer for those who follow. Its dedicated to my mother, Elizabeth Darlington, who passed a little over 2 years ago. In the tradition of all the Earth is Sacred, there is a drum song, empty of words... And the song for the Amazon rainforest, Force of the Forest; which Ya'Acov and I wrote together. 10% of the proceeds from this album will go to the Pachamama Alliance to anchor this prayer in action. ! Susannah, "Torch Songs, and in honour of her mother and grandmother. from Susannah Darling Khan on Vimeo. 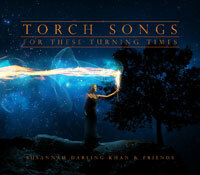 Torch Songs from Susannah Darling Khan on Vimeo.